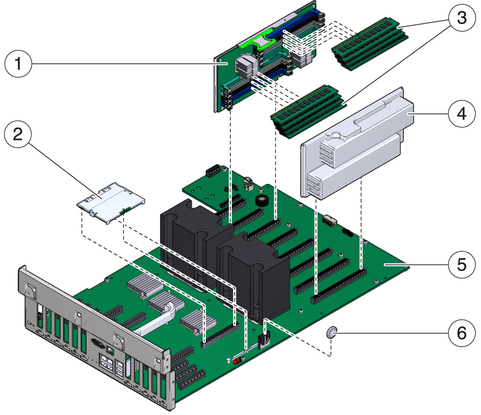 The following figure illustrates replaceable components related to the motherboard. Four memory risers are shipped with the server. Two memory risers are associated with each CMP. Remove the memory risers to add or replace DIMMs. Rear panel PCI cross beam must be removed to access risers. See configuration rules before upgrading DIMMs. Must be installed in blank memory riser slots. Must be removed to access power distribution board, power supply backplane, and paddle card. Necessary for system clock and other functions.